gineer. What’s also great about Season 2 is that whether you are looking to buy your first home or get into the flipping business, it gives you the lessons to do so. AM: We don't want to spoil the premiere episode; however, we love that we are introduced to someone who has fallen in love with a flipped house - what are the common situations you find that flippers fall into that are bad habits that you look to break them of? ST: You’ve got to separate your emotions from your flip. Even your first time home purchase when you are remodeling your house. You always have to keep your eye on your comps and know what things are selling for and what you can invest and what you shouldn’t invest. Always establish your budget on the front end and don’t let your emotions get in the middle of the renovation. It becomes very dangerous when your emotions get involved because you don’t keep the budget at the forefront, you start over investing and taking longer than you should and that is where you can get into a lot of trouble. AM: What checklist would you suggest for someone who is thinking about flipping to assess whether they are the right person to engage in this investment? 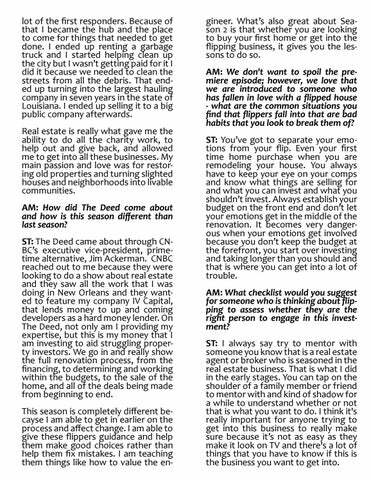 ST: I always say try to mentor with someone you know that is a real estate agent or broker who is seasoned in the real estate business. That is what I did in the early stages. You can tap on the shoulder of a family member or friend to mentor with and kind of shadow for a while to understand whether or not that is what you want to do. I think it's really important for anyone trying to get into this business to really make sure because it’s not as easy as they make it look on TV and there's a lot of things that you have to know if this is the business you want to get into.